Is ‘The Meg’ The Next Franchise? Jason Statham fights a really huge shark in The Meg, and based on those few words the movie could – and should – be the biggest movie of summer 2018. But the movie didn’t just suddenly swim up from the depths of nowhere. The Meg, opening August 10, is based on a 1997 novel by Steve Alten, and has taken nearly 20 years to develop. The two decades it took to make the movie might be a good thing, because that’s how we ended up with this version of the story, starring Statham. That time also gave Steve Alten time to write a whole series of sequels, which means The Meg could easily spawn a franchise which will let us see Statham fight off a whole legion of giant aquatic monsters. Here’s how. 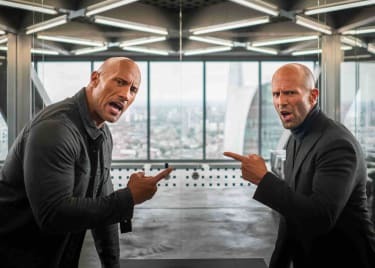 In The Meg, Jason Statham plays Jonas Taylor. In the original novel he’s a former Navy deep-sea pilot now working as a marine paleontologist, who encountered the megalodon many miles below the surface of the Pacific. The megalodon – or “the Meg” – is a giant prehistoric shark which fed on whales, but has long been thought extinct. It isn’t, of course, and at least one still roams the oceans, ready to chomp down on Jonas Taylor and other people like him. Some version of that basic setup is going to power the film version of the story as well. We won’t spoil the potential ending of The Meg, but suffice to say there’s a very good method that the story could continue into more films even if, by some chance, Statham and friends manage to kill the giant shark in this first film. Alten’s first sequel novel is called The Trench, and it ups the ante on Meg’s premise by combining the threat of another beast with some pretty serious human villains. (If anything, it’s similar enough to Jurassic World: The Lost Kingdom that substantial changes might be made for any film adaptation.) A whole character set is established in The Trench which could easily drive a second film and further sequels. With another five books completed after The Trench, Alten has laid the ground work for a film franchise, though the film producers could just as easily solicit new ideas for scripts that veer completely away from the published novels. Point being, there’s clearly a whole ocean’s worth of franchise material in the Meg concept. Then there’s director Jon Turtletaub, who called the shots on The Meg, and has made two National Treasure movies, among other film and TV projects. He’s franchise-ready, and if a sequel to The Meg was announced it wouldn’t be a surprise to see Turtletaub on board. For a series like this you need a director with mainstream sensibilities who can deliver action and effects on a budget, and he’s known for all of the above. While we’re talking about director Turtletaub’s National Treasure films, let’s also remember that those two movies, and Turtletaub’s film The Sorcerer’s Apprentice, starred Nicolas Cage. Based on that we’re going to dive right into hopes that we might get to see Cage fight a massive shark – and we wont’ be satisfied until we see Cage screaming right in a prehistoric monster’s face. That’s reason enough to dream of a franchise that swims on from this giant shark move. The Meg takes over theaters on August 10.